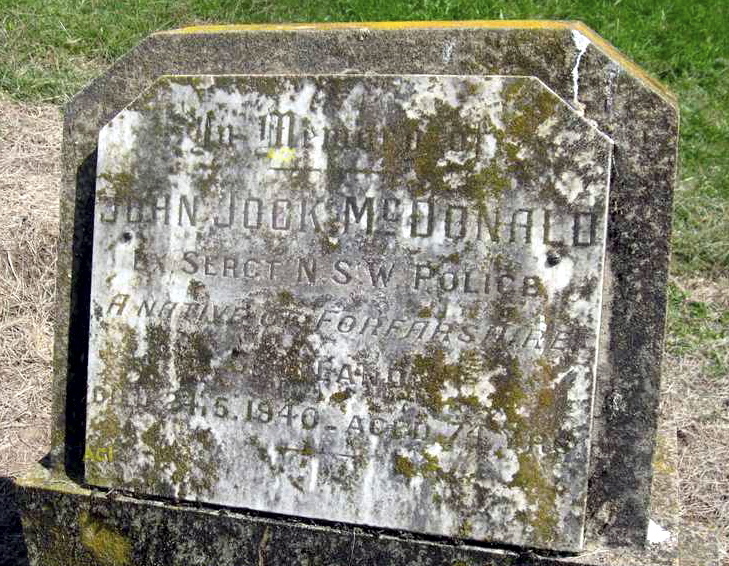 Mr. John McDonald, of Hampton, who died in Lithgow hospital early this morning at the age of 74, was for a long time in charge of the Central police barracks, Central-street, Sydney. Many senior officers of the force passed through his hands, including the Commissioner of Police ( Supt. MacKay ) ; between the two there was always a close friendship. The late Mr. McDonald, a native of Scotland, retired from the force 15 years ago with the rank of sergeant. All his service took place in the metropolitan district. He had lived at Hampton since his retirement, spending his time at a number of guest-houses. As in Scotland, he was an enthusiastic mountain-climber, and spent much of his time on walking expeditions. He took a keen interest in the district and its progress, and made many friends. He was unmarried. Mr. McDonald was taken ill 13 months ago, and spent five months in Dudley Hospital, Orange. Shortly after his return to Hampton he was confined to his bed, and was admitted to the Lithgow institution. The funeral has been arranged for to-morrow afternoon, and will leave Messrs. Matthews and Lemon’s parlors, Mort-street, after a service, commencing at 2.30, for the Presbyterian portion of Lowther cemetery. The Commissioner of Police, owing to the ill-health of Mrs. MacKay, will not, be able to attend, but will be represented by Inspector J.J. Fogarty, of Bathurst. Katoomba, Bathurst and Lithgow police will be present. Mr. John McDonald, of Hampton, died in Lithgow Hospital last Thursday, at the age of 74. He was for a long time in charge of the Central Police Barracks. Many old Mudgee police officers passed through his hands. The deceased was taken ill thirteen months ago, and spent five months in Dudley Hospital, Orange. Probate Jurisdiction – In the Will of JOHN McDONALD late of Hampton in the State of New South Wales, Retired Sergeant of Police, deceased. – Application will be made after fourteen days from the publication hereof that Probate of the last Will of the abovenamed deceased dated the twenty-fifth day of October one thousand nine hundred and thirty-seven may be granted to the PUBLIC TRUSTEE the Executor named in the said Will and all notices may be served at the under-mentioned Proctors for the Executor, 88 Pitt St, Sydney. THE LATE MR. PAUL HAMMON. The remains of the late Mr. Paul Hammon, a universally popular young resident of Scone for a number of years, and whose sad and untimely death was referred to in last Tuesday’s issue, were laid to rest in the Randwick Cemetery on Monday last. The chief mourners were Mr.E. Nelson (his pal), and Mrs. Hyort and family, (for his mother), Mr. and Mrs. Larsend. Thirty-eight members of the Police Force headed the cortege to Randwick, Inspector Young representing No. 4 Police Station and Sergt. McDonald attending on behalf of Central Police Barracks. The Rev. Walker conducted the burial service. Wreaths were forwarded from Comrades of No. 4 Police Station and of Central Police Barracks, Executive of the Police Association, Mrs. Hyort and family (on behalf of his mother), Mr. E. Nelson (Scone), Mr. Quist (Scone), Mr and Mrs. Larsend (Danish Club), Mrs; P. H. Head and children, Mr. Dalhroad, Mr. Dalberg, Danish Club ” Thor, ” Mrs. Hill and family, and Loyal Strangers’ Friend Lodge, No. 121, Scone. On 5 August 2016 I made numerous Google enquiries for Paul HAMMON to see if he was an actual member of NSW Police Force or simply an associate of the Police Force. I was NOT able to locate ANY further information about him. A calf was arrested about midnight and interned at the central barracks. It bellowed for the rest of the night, and greatly annoyed over 100 men in their quarters, and many prisoners in the cells. The story of the calf’s doings have been told from police station to police station throughout the metropolitan district. When Superintendent Nolan heard of the “arrest” from sergeant MacKay, who had been furnished with a brief report of the affair, he had to laugh, even if there are men on beat duty in the city to-day who are weary from want of sleep. Procuring a piece of rope from a yard close by, Shirlow and Collard secured the calf, and, wheeling their bicycles, they moved it alone to the Central Police Station. ” We’ll have to put her in the coal-house “, remarked one of the men. However, she was placed in the coal-house. She went on singing her song, which lasted till daybreak. Sergeant “Jock” McDonald, who has charge of the central barracks, became alarmed. Rushing downstairs from the men’s quarters he demanded to know what was going on. ” My men are waking up. They must have their sleep, and if this goes on they will not be fit for duty, ” he called out. Nothing could he done. There was no other place to put her. She finished up about 6 a.m., when she was removed to the police depot in a motor van. One old woman who had been arrested for drunkenness the previous night thought she would help the calf vocally, and she added a song or two. Calfie is at the police depot. The police do not know what to do with her. They want her owner to take her away. ” She had no milk yesterday, and seems to want some, ” was the remark of a man at the depot this morning. ” I think by the look of her, she would want a thousand gallons a day to make her look well. The calf is believed to have strayed away from a wharf. 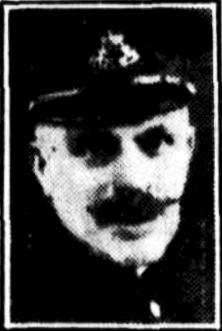 SERGEANT McDONALD, who has had charge of the Central Police barracks for over nine years. He is on leave of absence prior to retirement from the force. He joined the service in 1903.